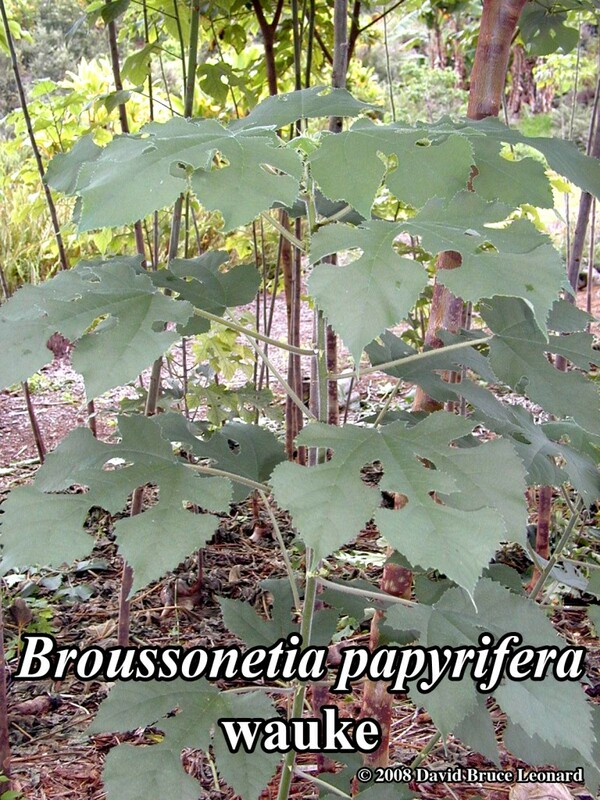 PLANT NAME: Broussonetia papyrifera (L.) Venten. COMMON NAMES: Wauke, po’a’aha [Hawai’i]; paper mulberry [USA]; u’a [Samoa]; chu (whole plant), chu shi zi (fruit), gu shi (fruit), chu tao (fruit) [China]; kajinoki [Japan]. STATUS IN HAWAI’I: Polynesian introduction (“politically correct” alien). An aggressive pest in more than ten countries, including the US, wauke has minimal pest factor in Hawai’i. It has rich significance as a heritage plant in Polynesian societies. RANGE: Native to China and Japan. The historical spread of Broussonetia papyrifera can be traced along known migration routes. HABITAT: Edge of stream and lo’i (taro fields). Wet and sunny. Can tolerate partial shade. GATHERING: In Asia, the plant flowers in May. Ripe fruit is collected and washed in fall. Cortex, latex, and bark are gathered all year round. Leaves are gathered fall and summer. The serrated lobed leaves are easily identifiable and have a coarse “sand-paper” texture. CAUTIONS AND CONTRAINDICATIONS: Prolonged use is reported to weaken the bones. In 105 A.D., a man named Ts’ai Lun made the first paper from Broussonetia papyrifera in China.